Team Illinois dominated when the nation’s best wrestlers gathered in Fargo, North Dakota this summer and took to the mats for bragging rights and pride. Illinois finished the freestyle tournament with 93 points. Iowa came in second with 55 points. Illinois also finished the Greco tournament with more points than any other state. Now our state is sending four wrestlers to be part of U.S. team that will take on the world. 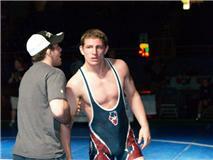 Those wrestlers will compete in the 2011 FILA Cadet World Championships in Szombathely, Hungary August 23-29. Sam Brooks, an OPRFHS senior this year, is one of those wrestlers. Darius Henry, a junior at OPRFHS wrestler is also going, as well as Matt Rundell, an incoming OPRF freshman and a former Little Huskies wrestler. Also from Illinois are Zane Richards from Carbondale and Mitchell Alexander from Conant High School. The U.S. Olympic Committee pays for some of the cost, but athletes are responsible for a large dollar amount. To help defray that you are invited to the Illinois’ World Championship Party! a benefit to raise money for Illinois wrestlers competing in Hungary. WHERE: Guides Sports Club, 5544 S. Archer Ave Chicago, IL 60638. Tickets are $50 per person (includes pizza, pasta, salad, and open bar). I know I can speak for the athletes and their families when I say we could not be more grateful for your support. ” Spend some time thinking about the thoughts that get you into the state of discouragement and choose to say something different, something more empowering. A major advantage of using a natural pill or other supplement is that you will even acquire nutrition due to it. As I write this I’m still finding it hard to believe. When first starting out, try to give people the best deal on the site or close to it. This will take advantage of RSS subscribers who view your feeds frequently. I need to to thaqnk you for this fantastic read!! mobile application development, and mobile site development among other things. Thanks for sharing your thoughts on wrestling mom.